Cambodia officially known as the Kingdom of Cambodia and once known as the Khmer Empire, is a country located in the southern portion of the Indochina Peninsula in Southeast Asia. Its total landmass is 181,035 square kilometres (69,898 sq mi), bordered by Thailand to the northwest, Laos to the northeast, Vietnam to the east, and the Gulf of Thailand to the southwest. The Foreign and Commonwealth Office (FCO) advise against all travel to the Preah Vihear (Khaoi Pra Viharn in Thai) temple area and the Ta Krabey/Ta Moan temple area located on the Thai-Cambodian border. National elections took place on 28 July 2013 in a mostly peaceful environment. The main opposition party continues to dispute the results and protests are ongoing in Phnom Penh with frequent roadblocks and congested traffic. There have been some clashes which have resulted in a number of deaths and injuries, including on 3 January. There have been a number of security alerts about small explosive devices found around Phnom Penh, the most recent on 13 September 2013 outside the National Assembly building. There is a low threat from terrorism. 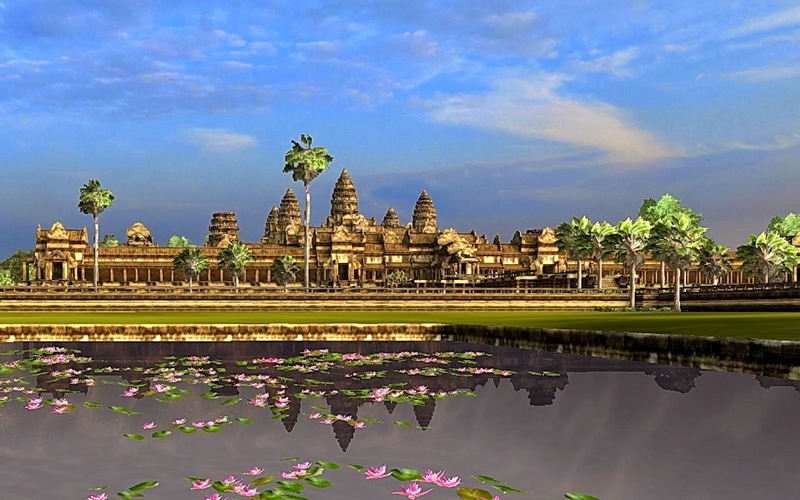 Angkor Wat, the largest religious monument in the world which Suryavarman II dedicated to the Supreme Hindu God Vishnu. The greatest attraction in Cambodia and one of the most spectacular ancient sites on earth, Angkor is a vast temple complex featuring the remains of several capitals of the Khmer Empire, from the 9th to the 15th century AD. These include the famous Angkor Wat temple, the world’s largest single religious monument, the Bayon temple (at Angkor Thom) with its multitude of massive stone faces and Ta Prohm, a Buddhist temple ruin entwined with towering trees. Although officially part of the Angkor complex, Banteay Srei lies 25 km (15 miles) north-east of the main group of temples, enough to list it as a separate Cambodia attraction here. The temple was completed in 967 AD and is built largely of red sandstone, a medium that lends itself to the elaborate decorative wall carvings which are still clearly visible today. Banteay Srei is the only major temple at Angkor not built for a king, instead it was constructed by one of king Rajendravarman’s counselors, Yajnyavahara. Koh Ker was the capital of the Khmer empire for a very brief period from the year 928 to 944 AD. In this short time some very spectacular buildings and immense sculptures were constructed. The site is dominated by Prasat Thom, a 30 meter (98 ft) tall temple pyramid rising high above the surrounding jungle. A giant Garuda (mythical half-man, half-bird creature), carved into the stone blocks, still guard the very top, although its partially covered now. Left to the jungle for nearly a millennium, Koh Ker was one of Cambodia’s most remote and inaccessible temple destinations. This has now changed thanks to recent de-mining and the opening of a new toll road. Kratie is a small town located on the banks of the Mekong River and is dominated by a central marketplace surrounded by old, French colonial buildings. There’s no large scale tourism, but plenty of backpackers pour through here during the peak season. It is the place in Cambodia to see the rare Irrawaddy dolphins, which live in the Mekong River in ever-diminishing numbers. It is estimated that there are between 66 and 86 dolphins left in the upper Cambodian Mekong area. Bokor Hill Station near Kampot was built by the French in the 1920s to be used as a retreat from the heat of Phnom Penh. It has since been abandoned twice, first in the 1940s when the Japanese invaded Cambodia and again in the 1970s, when the Khmer Rouge engulfed the country. Today, Bokor Hill Station and its abandoned buildings have an eerie, ghost-town feel. As of October 2008, the road to Bokor is officially closed due to ongoing reconstruction. Independent access seems to be impossible. though there are hiking tours arranged by local travel agents. Located within the Royal Palace compound in Phnom Penh, the Silver Pagoda houses many national treasures such as gold and jeweled Buddha statues. Most notable is a small 17th century baccarat crystal Buddha (the Emerald Buddha of Cambodia) and a life-sized gold Maitreya Buddha decorated with 9584 diamonds. The internal wall of the Silver Pagoda courtyard is decorated with a richly colored and detailed mural of the Ramayana myth, painted in 1903–04 by 40 Khmer artists. Tonlé Sap is the largest freshwater lake in South East Asia and is of major importance to Cambodia. The lake expands and shrinks dramatically with the seasons. From November to May, Cambodia’s dry season, the Tonlé Sap drains into the Mekong River at Phnom Penh. However, when the year’s heavy rains begin in June, the flow of the Tonlé Sap changes directions and an enormous lake forms. Tonlé Sap is home to many ethnic Vietnamese and numerous Cham communities, living in floating villages around the lake. Sihanoukville, also known as Kampong Som, is a port city and beach resort on the Gulf of Thailand. The big attraction here are the white-sand beaches and several undeveloped tropical islands. Sihanoukville is a good place to relax and unwind, though be prepared to battle the crows during the high season or a holiday weekend. Preah Vihear is a Khmer temple situated atop a 525 meter (1,722 ft) cliff in the Dângrêk Mountains, on the border between Cambodia and Thailand. It has the most spectacular setting of all the Khmer temples. Most of the temple was constructed in the 11th and 12th century during the reigns of the Khmer kings Suryavarman I and Suryavarman II. It was dedicated to the Hindu god Shiva. Preah Vihear is the subject of a long-running territorial dispute between Thailand and Cambodia, and several soldiers were killed in clashes in 2009. Siem Reap (literally “Siam Defeated”) is undoubtedly Cambodia’s fastest growing city and serves as a small charming gateway town to the world famous destination of the Angkor temples. Thanks to those Cambodia attractions, Siem Reap has transformed itself into a major tourist hub. It is laid-back and a pleasant place to stay while touring the temples. Siem Reap offers a wide range of hotels, ranging from several 5-star hotels to hundreds of budget guesthouses while a large selection of restaurants offer many kinds of food. Preah Vihear temple is located in Svay Chhrum village, Kontuot commune, Choam Ksan district, about 108 kilometers north of Preah Vihear provincial town. Preah Vihear province was created in 1964 by cutting the land from Stung Treng, Kampong Thom and Riem Reap provinces. The province is at the north of Cambodia, on the plateau that is rich in forests, mountains and streams. The temple was originally known as Sreisikharesvara, which means the power of the mountain. The temple was built over 300 years in the late 9th and early 12th centuries to worship Shiva Brahmanism by four kings.